Ahead of the Brexit vote in the UK, which could lead to the biggest change in the European Union in many years, our chart from another part of Europe reveals some familiar television viewing patterns. As with Poland (May 29-June 4), House of Cards and Game of Thrones are the most in-demand series in our latest charts. 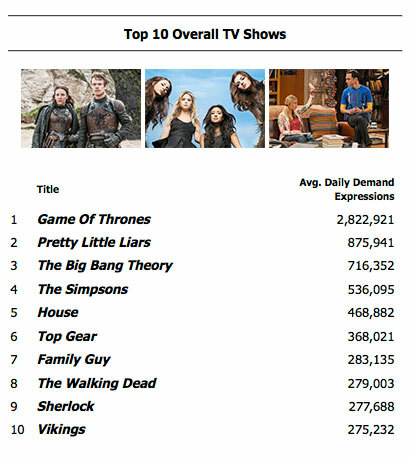 HOC is only slightly ahead of Narcos on the digital front, but Game of Thrones’ ultra-engaged fanbase gives it almost two million more demands than the overall second placed show, Pretty Little Liars. Third place for Orange is the New Black is perhaps surprising, given its fourth season debuted on June 17. Netflix last week released data showing almost half of regular OITNB viewers globally re-watch previous seasons in June. 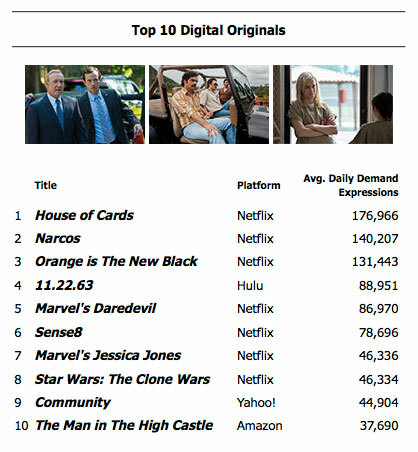 The show’s digital home, Netflix, is slightly less dominant in the Czech Republic than many other European territories, providing seven of the top ten series in the digital chart. It does, however, have six of the top seven, with the continually in-demand Hulu drama 11/22/63 puncturing that block in fourth place. Regulars in the digital top ten, Marvel’s Daredevil (86,970), Marvel’s Jessica Jones (46,336) and Star Wars: The Clone Wars (46,334) are present in this week’s chart, with Yahoo!’s Community again appearing and Amazon Prime Video’s The Man in the High Castle, which was demanded in Germany, trailing the pack in tenth place. Overall, Game of Thrones is picking up speed as it heads towards the final episode of season six. As with four of the previous six lists, it is well ahead of the competition (in Denmark [April 17-23], it was marginally ahead of Vikings, and trailed The Walking Dead in France [April 3-9]). Pretty Little Liars makes another top three appearance, demonstrating the interest in the ABC studios-produced drama in Europe. Similarly, third-placed show The Big Bang Theory has appeared in the upper echelons of the overall charts in previous weeks. The evergreen Fox animation The Simpsons makes its first appearance, coming in at fourth place overall with 536,095 demand expressions. Another US legacy show, House, is fifth (468,882). Though its ratings in the UK are tanking, BBC Worldwide’s Top Gear is still generating interest in the Czech Republic. Its 368,021 expressions hand it sixth place, ahead of Family Guy (another debutante), The Walking Dead, Sherlock and VIkings.